Buffalo State - State University of New York (SUNY) offers graduate credit for SEC12 attendance. More than 500 educators from schools throughout the NESA region (and beyond!) convened March 31-April 3 in the “cradle of democracy” — Athens. They attended three keynotes, three half-day institutes, four teacher-produced workshops (from a choice of 59! ), and one general interest workshop. The three morning keynotes on Days One, Three and Four addressed how the innovations and changes of the 21st century are impacting education and redefining what it means to be human: David Miles, sponsored by International Schools Services, looked at the impact of the internet on children’s brains and on education and whether it is a force for good or bad in, “Digital Citizenship: Technology, Education and a Call to Action”; Ian Jukes, sponsored by Buffalo State, State University of New York (SUNY) outlined the critical 21st century skills students need to excel in school and life in, “Education in the Age of Disruptive Innovation”; and Tim Burns examined how new brain research is revolutionizing the ‘nature of human possibility’ in “The Anatomy of Possibility: Integrating Brain, Body and Heart Intelligences for Enhanced Learning, Performance, Creativity and Well-being”. On each of the first three conference days (Saturday, Sunday, Monday) delegates chose from a wide range of four-hour "specialist institutes" on topics ranging from “having hard conversations”, “restitution”, elementary mathematics, and grading and reporting, to supporting young writers, technology infused project learning, using movement and creative play to facilitate learning, and literacy and boys. A strand on teaching strategies in science was presented in Arabic, and a two-part institute for executive/administrative assistants was offered as well. Additionally, Bob Garmston and Carolyn McKanders led a “Five-Day Adaptive Schools Certificate Program”, and Erma Anderson offered a two-day preconference on, “Using Depth of Knowledge to Increase Rigor of Classroom Instruction and Assessments”. Several awards were announced during the conference: Amara Aarif from the American School of Doha, Qatar, won the Stanley Haas/Luke Hansen Student Award, sponsored by GBG/TieCare International. Amara was NESA's guest in Athens and addressed a plenary session of delegates. 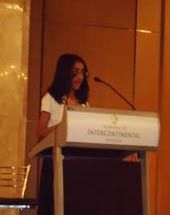 Click here to view Amara her giving her speech. Laith Kalai from the American Community Schools of Athens, Greece, was announced as the winner of one of four $4,000 Margaret Sanders Foundation International Schools Scholarships. Additionally, NESA Math League awards for 2011-2012 were announced and certificates and plaques distributed. NESA expresses its appreciation of Math League Coordinator, Art Radtke (AS-Dubai) — who will retire next year — for his time and effort over the years. 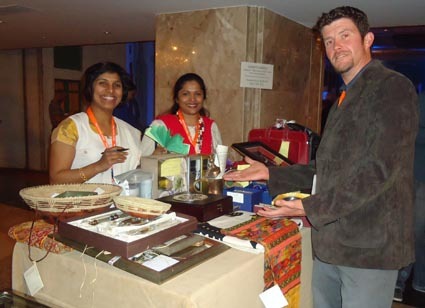 NESA Teacher Representatives sold raffle tickets throughout the conference for the annual Charity Raffle. This year, at the suggestion of the Teacher Reps, proceeds from the raffle were donated to Operation Smile (www.operationsmile.org), an organization dedicated to providing children worldwide with free surgeries to correct facial deformities (its founder, Dr William Magee, keynoted at the 2011 Spring Educators Conference in Bangkok). Several NESA schools are involved with Operation Smile. We’re pleased to report that more than $4,800 was raised! NESA conferences are a balance between professional and personal renewal. To that end, delegates networked at the Welcome Reception Saturday night, in the InterContinental’s ballroom that was transformed into a traditional Greek village; and at the Gala Dinner Monday evening, sponsored by GBG/TieCare International, which featured an excellent Greek buffet, a folkloric dance performance by the ‘Dromena’ dance group — which included delegates showing off Greek dance steps they learned during Sunday afternoon’s free dance lessons! — and of course, burning up the dance floor to ‘western’ tunes (Disco lives! ).